A new community garden (please note: file size is large and may take some time to download) is being constructed in Kew on the grassed road reserve adjacent to Earl Street. It will feature herb gardens and a food forest which will be open to all residents, as well as 50 individually allocated growing plots. Construction of the garden will be completed by June 2019. During the planning and design phase, the project was referred to as the Earl Street Community Garden, as the site sits along Earl Street on land leased from VicRoads. The final design of the garden has the main entrance along Carnegie Avenue, with a secondary entrance facing Willsmere Road. In naming the garden Willsmere Station Community Garden, we hope to help foster a strong sense of place for the community and garden users. The name reflects the location’s links to Boroondara’s past and the historic train station, which was part of the old steam era Outer Circle Rail Line that ran just for two years between 1891 and 1893. In October 2017, residents were recruited to join a Community Garden Working Group to help design the community garden and develop the vision and objectives shown below. View our short video of the working group’s first workshop to find out more. In late 2018, the Community Garden Working group formed an interim Committee of Management and is currently working with Council on finalising the management plan, preparing safety notes for gardeners and planning the food forest and pollinator attracting flower beds. When completed, the garden will be managed by the Committee of Management on behalf of Council. Members of the CGWG at their first meeting. a shelter and community gathering area with a storage shed. A separate public shelter, BBQ and public toilet (Exeloo) adjacent to the garden have been included in the design, but are not proposed for construction at this stage. Construction of these facilities will be dependent on further needs assessment, consultation and funding. Construction is underway and the garden is expected to be open before the end of June 2019. Council will manage the construction phase of the garden. Once completed, management of the garden will be the responsibility of an elected Committee of Management. Council will continue to support the garden. Further information about this committee and how you can get involved will be available closer to the opening of the garden. The garden will have a low fence (1.2 metre) and will be unlocked and accessible to the community at all times. All community garden related activities must be conducted during daylight hours. Residents will be able to apply to become plot holder members or general members. Plot holder members will be allocated their own plot and a container in the shed in which to store small tools. In addition they will have access to communal areas and are welcome to share in the harvest from these areas. Community groups will also be able to apply to become plot holder members. General membership will cater for residents who are interested in participating in communal gardening, but do not wish to manage their own plot. Also, if there are no plots currently available, general membership will allow residents to actively participate in the group while waiting for a plot to become available. General members will have access to communal areas and are welcome to participate in maintaining and sharing in the harvest from these areas. They will be welcome to join in all garden events and will have access to the shed to use communal tools. Membership costs have not yet been finalised. As a guide, other community gardens in Boroondara charge between $25 to $110 per annum for plots. Membership fees are used to meet the running costs of the garden. To express interest in an allocated plot, please email [email protected] to identify your interest, noting whether you wish to apply to become a plot holder or general member. Depending on interest, it is possible that the number of residents wanting a plot will exceed the number of plots available and a waiting list may be required. If more applications are received prior to opening than can be met with available plots, a ballot will be held. Following any ballot, any unsuccessful applicants will be placed on the waiting list with the order determined by the ballot. Plots will be allocated in order with new applicants being placed at the bottom of the list. If a resident would like to become involved in the garden’s activities while on the waiting list, they are welcome to become a general member (discussed above). These details are still being finalised. 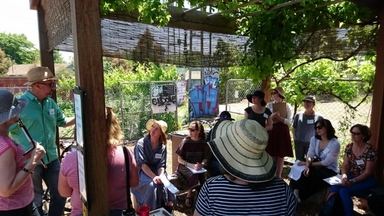 In keeping with the vision and objectives of the garden, plots will have defined periods of tenure to allow for a wider number of people to get the benefits of the garden; thus increasing community connection and reducing social isolation, strengthening local neighbourhood dynamics, and increasing the number of locals engaged in food growing. After their tenure ends, residents are welcome to rejoin the waiting list to access another plot when they reach the top of the list. For more information contact Amy Shaw, Senior Sustainability Officer at [email protected] or phone 9278 4083. Or, to contact the interim committee of management, please email [email protected].